Entrepreneurship and technology are aligned more often than not. However, it seems as if the world’s largest technology companies are coming around to supporting entrepreneurship on their own platforms. GoDaddy isn’t usually mentioned among the likes of Google, Apple, and Facebook, nor should it be. It’s operating in a completely different realm of innovation and serves a widely different demographic. GoDaddy is the world’s largest technology provider for small businesses. Its products aren’t those that consumers can hold in their hands, but the company holds a vast monopoly of domains, websites, hosting, web security, online marketing, and email services. With its business model designed around serving the world’s small businesses, which make up over 90 percent of business types in Canada, you could say GoDaddy is more equipped to service the most entrepreneurial members of the tech sector. 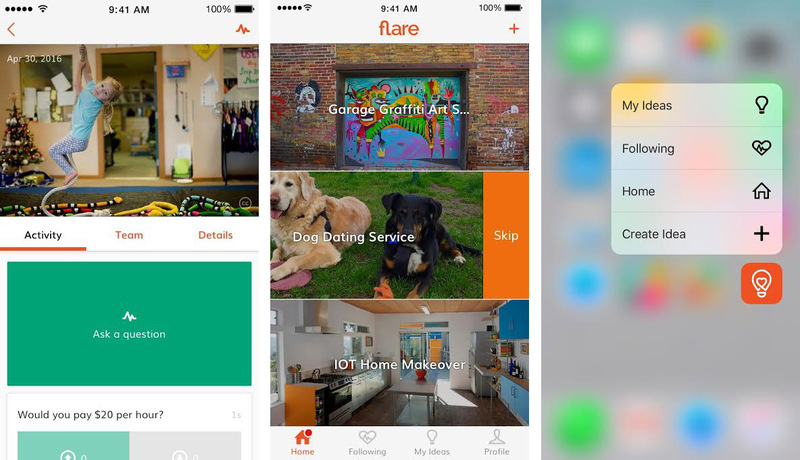 Flare is GoDaddy’s latest venture; an app dedicated to building a community of entrepreneurs and helping them pursue their ideas. The company argues in a statement sent to MobileSyrup that of 57 percent of Canadian respondents who reported wanting to start a business, only 38 percent actually pursued it. Despite a plethora of great ideas, the majority of Canadians don’t know what to do with them. GoDaddy designed Flare to provide aspiring entrepreneurs with an outlet for questions, and a place to go to for help. Ideas are only the beginning. Flare also includes a feature that allows successful entrepreneurs to become advisors and share their knowledge with those who want to know more. By supporting a concept, advisors have the opportunity to be “play an active role in its developmental journey,” according to GoDaddy. This isn’t the first time we’ve seen a large technology company make the strategic decision to support entrepreneurship. Google, Telus and others have gone the incubator route to avoid losing top talent to their own great ideas. This way, Both companies launched in-house incubators earlier this year. However, Flare pushes Canadians to pursue entrepreneurship not by helping them develop their ideas, but by helping Canadians help each other. “We are delighted that Canadians will have the opportunity to share their ideas, get immediate feedback, and build a social community of advisors. Flare will make it easier for people to pursue their entrepreneurial dreams,” said Jill Schoolenberg, vice president of GoDaddy Canada. Reinsburg believes that Flare is not just for entrepreneurs. It’s for anyone who wants feedback on their ideas. He explains that his first-hand experience have shown him how difficult it can be to get your idea in front of the right people. He, with GoDaddy in tow, are hoping to build those connections.